Intuition: Consciousness - How fundamental is it? 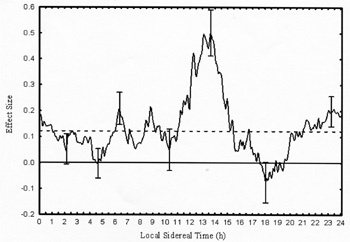 Local Sidereal Time (LST) is basically "star time". For a specific LST, the stars (except our sun) are in the same place in the sky when viewed from a given location on Earth. One sidereal day corresponds to one complete rotation of Earth on its axis. A sidereal day of 24 LST-hours is about 4 minutes shorter than the normal 24-hour solar day, because the Earth moves in its yearly orbit around the sun. Can the reliability of information obtained intuitively be associated with variations in LST? Surprisingly, the answer is yes. The first scientist to discover this association, or correlation, was James Spottiswoode who reported his results in a 1997 paper entitled, "Apparent Association Between Effect Size in Free Response Anomalous Cognition Experiments and Local Sidereal Time." Wow, the title is a mouthful, and the conclusions are very intriguing. The intuitive information for the paper was obtained from 44 studies done by the primary psi research organizations in North America and Europe. There were about 2,500 trials using remote viewing and ganzfeld experiments. These experimental trials involved participants who provided free response verbal or written descriptions concerning targets and/or photos that were unknown to the participants. These "blind" descriptions were compared to several possible targets/photos and the "best fit" target was chosen. This approach permitted a quantitative assessment of whether the intuitive descriptions were better than simple chance. The graph and associated text show the "effect size" variation with LST. Effect size is basically a measure of the difference observed in the intuitive target-choice approach applied in the experiments compared to a pure chance target-choice. An average effect size of 0.12 is very significant for 2,500 trials - intuition can provide useful information. Furthermore, the best time for gathering this type of information appears to be at a LST of about 13.5 hours plus or minus an hour or so. Note that the error bar at this time is very far (about 5 standard deviations) from the mean effect size of 0.12. Thus, at 13.5 LST, the data indicates a factor of 4 increase in effect size which translates into more successful target-choices. Also note that there is a negative effect size at about 18 hours LST which appears significant. A negative effect size implies that target-choices would be wrong more than expected by pure chance. What does Sagittarius A* (Sgr A*) have to do with any of this? At about 13.5 hours LST, Sagittarius A* (the massive black hole at the center of our Milky Way galaxy) just happens to be rising above the horizon for latitudes where the LST effect size data was obtained - between 32 and 55 degrees North. And, at about 18 hours LST, Sgr A* is at its high point in the sky - roughly 30 degrees above the horizon in the due south direction. The 18 hours LST apogee timing for Sgr A* has led to one hypothesis that an unidentified source of "noise" operates when we are most "exposed" to Sgr A*. However, this does not explain why at the 13.5 LST rise-time the noise is a minimum, nor why there is not a similar minimum in noise at 22.5 hours LST when Sgr A* sets below the horizon. If Sgr A* is somehow important for the LST effect size, then our galactic massive black hole reacts with the earth-air interface (visible horizon) in a non-symmetrical fashion at its rising versus setting times. There is much more to learn about LST effects and about Sgr A*. For those of you interested in knowing your LST time, the Astronomy Clock 2 shareware program is downloadable, or you can visit the Navy's online LST calculator. To locate the direction of our Galactic Center from your local position/time as well as LST time, you can use CyberSky. Apparent Association Between Effect Size in Free Response Anomalous Cognition Experiments and Local Sidereal Time.